The big question concerning the quality of fishing the Colorado in later summer and autumn is the water level and the water temperature. If there has been a strong snow year with a reasonably average to above average snow pack and the early summer is not too hot, there will be sufficient water to keep the temperature cooler in the Colorado. But if the snow pack is low or there is a hot summer which melts it off quickly with the result that the water temperature is warmer because the flows in the Fork are not sufficient to maintain a good flow of cooler water, the fish will hang low and out of the way and the fishing will not be good. So the key is to understand the water temperature at that time of year. 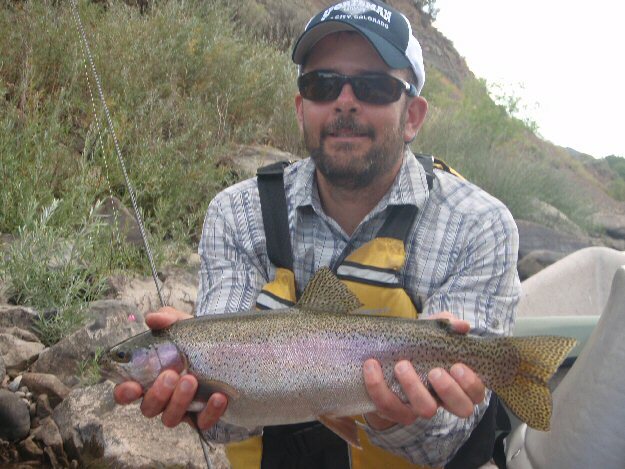 An example of a fish taken on the Colorado in September. Have a look at our photo section in August and September for a selection of the fish taken. This size is not unusual.